At the time of writing, there were only three ramen-related things I was interested in in America. The first was the Ramen Burger, that crazy food-fusion that hit New York by storm. But I am really only interested in eating it in New York, made by Keizo himself. So that one is tabled for the time being. Second was Ivan's shop, also in New York. Also out. 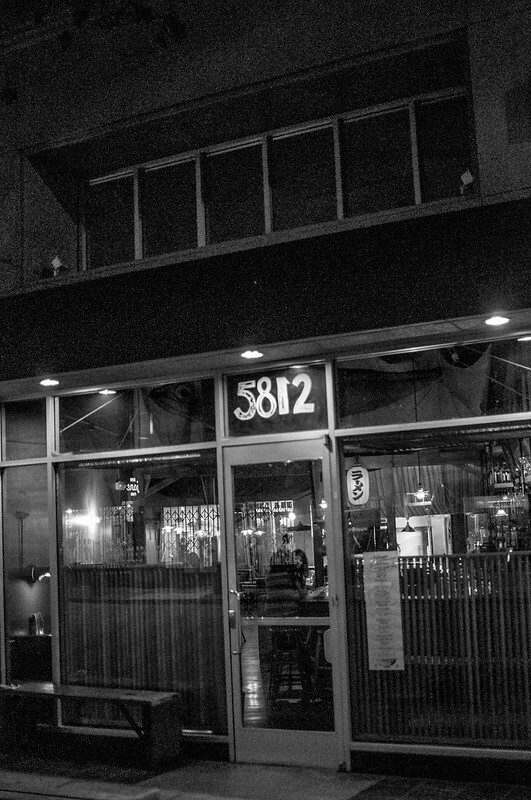 The third was Ramen Shop, the Oakland eatery started last year by three ex-chefs from Chez Panisse. Ramen Shop has probably the most talked about west coast bowl, and I wanted to see what the fuss was all about. The menu at Ramen Shop follows the current trend of most hot restaurants these days. Have your signature item, but supplement it with optional sides that end up becoming very un-optional. Add to that a full cocktail program and a waiting bar, and you are set. The food community is divided on this topic, with many wanting a more Japanese experience; get-in-get-out, eight seats, ramen only. Ramen Shop is more like 60 seats, and I don't think anyone just pops in for a quick bowl. The cocktail program is fantastic. Plenty of spirits from artisan distiller St. George, and four or five local micro brews on tap. The non-ramen menu is an all over the place mix of Japanese inspired plates. Sure, living in Tokyo, these are all standard things we know and love, but my memories of Bay Area life are very much devoid of Japanese pickles. For those keeping track, maybe I should quote the menu. Sansho cabbage, turmeric daikon, lime kohirabi, and Hainanese watermelon radish. The spicy quid fried rice really showcases the Chez Panisse roots of this shop. Local Monterey squid that was more tender than even some of the best I've had at high end sushi shops in Japan. Remember that scene from Jiro Dreams of Sushi where they massage the octopus for hours? This was better. Monterey Bay squid and pork fried rice with wild nettles, cilantro, and Siew's spicy shrimp-chili paste. But what about the ramen! I t is hard to give definitive opinions on the ramen at Ramen Shop, because the menu changes daily. On this particular night, French influences were high, and the ramen reflected that. Asari shoyu ramen with braised and roasted duck, salt-cured egg, hedgehog mushrooms, scallions, frilly mustard greens, and Mendocino nori. The duck shoyu was light and fresh, with the duck chasu being the highlight of a quality bowl. It should be noted that all noodles at Ramen Shop are made in house with a Japanese noodle machine brought over piece by piece from Sapporo, Japan. All noodles are great, on par with whatever you consider great noodles to be. By the way, best nori ever. Spicy tantanmen with ground pork belly, shoyu-marinated egg, miso-braised tripe, bok choy, cilantro, and shungiko. The tantanmen is ridiculously popular. Both the group to my left and the group to my right were slurping down on it. It got the French treatment from the sous chef, with a bit of tripe served as a topping. Excellent, but something was missing. Sansho, that Chinese numbing pepper that makes a heavy appearance in all my favorite Tokyo tantanmen spots. After inquiring, the waitress, a native of Nagoya, brought out a bowl of it. What a difference! Turns out they use it in some of the other dishes. This night just have been due to the French-heavy theme of the night. Scouring the internet for other photos will show some much spicier looking bowls. Black sesame ice cream sandwich with brown sugar cookies. And there you have it. A clear winner out in the East Bay, if you don't mind the wait (a TON of negative reviews exists solely because of the one to two hour wait). Airport ramen is almost always a miss. But what about at Fukuoka Airport. Fukuoka, the mecca of stinky tonkotsu ramen! With the worst snowstorm in decades hitting Tokyo, we had some time before our flight. Three hour delays to be exact. And a bit of the stinky stuff. Get the set, and dump the spicy roe and rice in your left over soup. Look, this wasn't the best bowl out there, and it would certainly fail in any comparison to the yatai of Fukuoka, but in a pinch it was a memorable meal. Coupled with a few nama beers, and waiting for the snow to pass was no problem. Exactly one year ago, I was randomly lucky enough to have work during Nagasaki's annual lantern festival. I also learned that you should avoid the restaurants and go for street food. It seems like everyone and their obasans make their way to Nagasaki for this event. Expect a wait! This year was a repeat of last, with a little less free time. Just enough time for my staff and I to gab dinner before heading to nearby Saga Prefecture. I recommended Kosanro for their excellent champon, but we were told that during the event, only $50 courses were on offer. That, and an hour wait. It might surprise you, but the average Japanese person despises long lines for food just as much as the average American. I made a vow years ago to keep my elitist foodie opinions to myself, and accepted that we were now going to the only place in Nagasaki without a line. This is in the heart of Nagasaki's Chinatown. Being a San Francisco native, I can tell you one piece of advice; don't eat at empty Chinese restaurants! But like I said, when I'm with a group of coworkers, I keep the opinions to myself. Just smile politely, drink a lot of beer, and eat. But this is Ramen Adventures, so I can be frank. Just accept your fate and wait for the good stuff. Otherwise, this will happen. Horaiken was garbage, and probably survives simply on the fact that it is next door to Kosanro, an excellent spot that always has a wait. I waited in line at a ramen event years ago to sample Ueda's ramen. After over three hours, with non-ramen obligations on my schedule, I left, vowing to someday make it out to the regular shop in Shiki. As luck would have it, the TV shooting on this day would take us there. Ms. Ueda is a bit of a draw. She has been likened to the kindly, yet stern Yubaba from Spirited Away, the magical Ghibili movie from 2001. Tough as nails, it is fitting that this bowl gets the treatment it does. The burning is a two part process. First, the shoyu tare is fried up in the bowls. Tare is the essence of ramen's flavor, so you can imagine how burning it to a crisp would make this an intense bowl. Second, the broth is added with a bit more oil than average on top. Again, you are witness to an intense pyrotechnics show. The result is flavorful, deep, and smoky. Also, burning oil is hot. Take care! Shiki isn't far from Tokyo proper; just about 20 minutes from Ikebukuro. Ramen fans could easily have a day of ramen hunting up this way. Kawagoe is also nearby, with plenty of great shops like Ganja.